Perseverance is an important value to develop in your kids, and a tough one. As one grows older the challenges that life throws at them get tougher and tougher. It is a tough one because it will, at times, require making demands on your kids that you feel may jeopardize your relationship with them. Perseverance is often learned by having to battle with something that is difficult for a long time until you have mastered it. The classic for many kids is piano lessons. Piano lessons are a good example because it normally takes several years to get to the point where you can sound good and actually enjoy it. Usually those that reach the point of enjoyment have learned a lot about perseverance because it has not been easy for them or for their parents. Many parents wonder whether it was worth the battle and many decide the answer is no. For some school can be the challenge that teaches them perseverance. For others it is sports. It is good for a parent to encourage your child to work to develop some skill that does not come easy for them. Three and four year-olds exhibit much spontaneous activity. This is necessary for positive development. Out of this activity, logical reasoning emerges at later ages. Parents can encourage safe situations that allow children to take the initiative, play, experiment, reason, and interact socially. Uninterrupted time will help children develop longer attention spans. Five and six year-olds use play as child-directed work. Through play, children learn many things: cooperation, role taking, knowledge about the physical environment and meaningful symbols, how things fit into space, planning and problem-solving. Positive examples by adults and lots of manipulative materials will help children discover the relationships between their effort and the products of their work. Seven to nine year-olds are finding ways to channel their inner motivation into industry and productivity. They are learning self-discipline and work habits. Puzzles and games are important. Adults can encourage children’s interests in a variety of activities, so children can find out what they are good at doing. As parents allow children to freely pursue their interests, they make it possible for children to become aware of, and to correct, their own mistakes. Make a family list of ways to encourage each other. Post the list near the refrigerator to remind each other to use positive words. Use phrases such as: You can do it! Keep it up! Fantastic! That’s Great! I enjoy watching you work! Make some musical instruments. Staple two paper plates together, with dried beans or rice inside, for a shaker. Use two rulers or dowel rods to create rhythm sticks. Strike a wooden spoon against a metal bowl or a plastic bucket for a drum. Create an obstacle course from boxes, chairs, tables, mats, pillows, rope, tires, rug, or stepstools. Use as least four pieces to challenge children to crawl under, walk over, roll across, creep through, and so forth. Allow children to rearrange the equipment for more challenges. The video that ties into this value is “Spike and the Terrible Tripped-Up Tap Dance.” In this video, Mr. Quigley and the kids give examples of the value of working hard despite disappointments. The Village friends put together the Village Talent Show. Trundle practices his magic tricks in order to appear as The Great Trundini. Molly and Danny prepare to sing a song together. Milty and Bubba create puppets for their puppet show. Lemon tells some jokes. 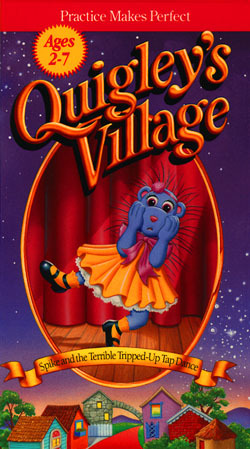 Spike decides to give a dazzling tap dance routine, but she thinks she does not need to practice because she saw someone tap dance on television. Once on stage, Spike discovers that her interest is not quite enough to help her really tap dance. “Spike and the Terrible Tripped-Up Tap Dance” suggests that it is good to work hard toward a goal and continue an activity in spite of difficulties. Young children are instinctively motivated to try new things, to take risks, and to learn. Parents may find themselves putting limits on such initiative! But when we limit a child’s exploration, or re-direct a child’s attention, we’ve interrupted a child’s perseverance, which is a positive quality. Have a family talent show. Each member of your family can make a contribution, such as: singing, puppets, tell jokes, read a poem or story, turn somersaults, play an instrument, draw a picture. Make an “APPLAUSE” sign to encourage audience response! Mix some home-made bubble. Combine water, Dawn or Joy dishwashing detergent, and glycerine. Cut a large ring out of the plastic lid from a coffee can or an ice cream bucket to use a blow giant-size bubbles. “Ready, Set, Go!” Stan and Jan Berenstain. New York, NY: Random House, 1988. “Renfro Would Rather Rest,” Jack Gerst. Cincinnati, OH: Standard Publishing: 1989. “The Clever Carpenter,” R.W. Alley. New York, NY: Random House Publishers, 1985. “The Little Engine That Could,” Watty Piper. New York, NY: Platt and Munk, 1961.